To make tomato salsa – combine diced tomatoes, red onion, chilli and half the lime juice in a bowl. Season with salt and pepper, stir until combined and set aside. To make guacamole – combine remaining lime juice and avocado in another bowl, season with salt and pepper and mash with a fork until a paste is formed. Set aside. Heat oil in a frying pan on a med-high heat. Add cumin and stir for 30 seconds until fragrant. Add onion and stir for 2-3 minutes until soft. Add mushrooms and stir for a further 4-5 minutes until soft. 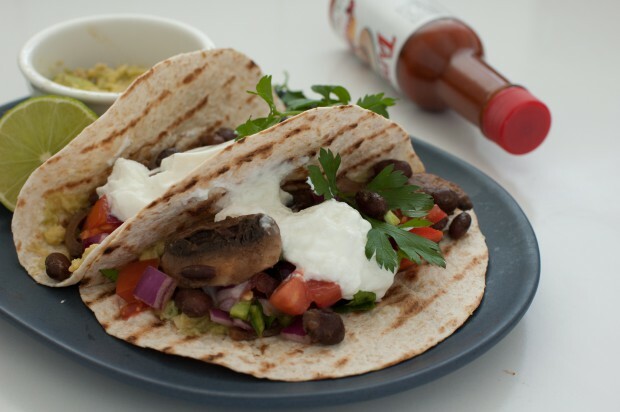 To assemble taco spread some guacamole into centre of tortilla, top with bean mixture, tomato salsa and a dollop of greek yoghurt.